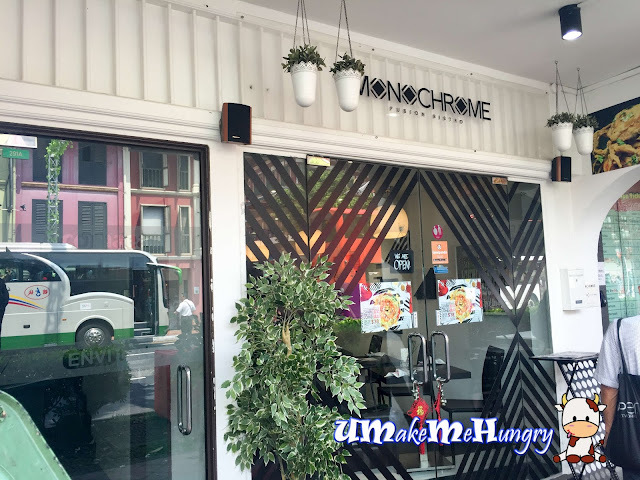 Making this Valentine's day special, we had our lunch over in Monochrome Fusion Bistro which is quaintly nestled among the row of shop houses at the Chinatown district, directly opposite the Buddha Relic Temple. As photography hobbyists ourselves, the word Monochrome speaks close to our heart and somehow we found ourselves closely related in there. Interior is modernly design to taste, with colors making up of black and white which is in line with their Monochrome theme. The dining area is a long walkway from the entrance and all the way to their cashier counter. 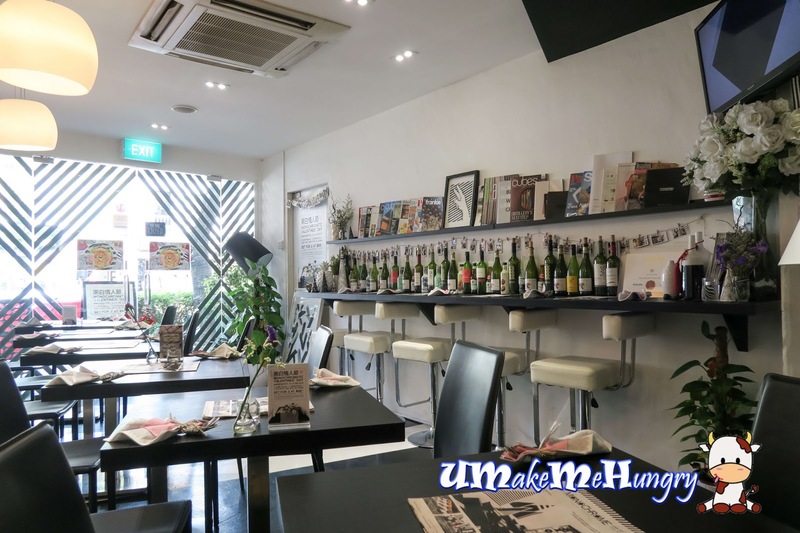 In fact it is divided to two section, the one nearer to the entrance has dining on bar counters too. However, the temperature is much more cooler if you were to have the inner seating. As we were ahead of our reservation timing, there were Keeping our order to a convenient way, we took up the Valentine's time day set at $68 ++ for 2 pax. The package comes with a choice of salad and soup of the day with 2 main courses (mains or pasta) and a dessert for 2. 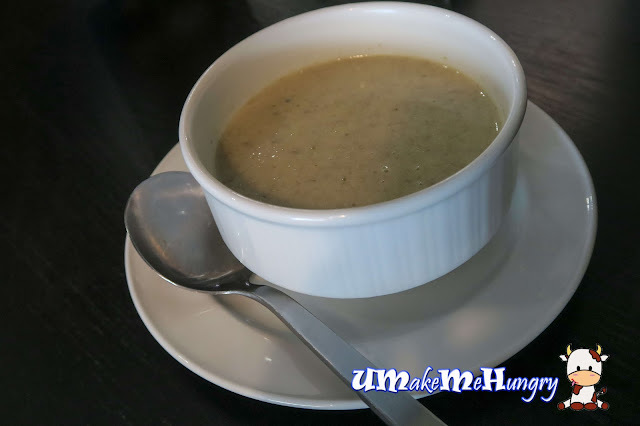 With Mushroom Soup as their soup of the day to start our Valentine's Day Meal. Soup was not too thick and was quite hearty with mushrooms bits. Looks like it had short of some toast to go along. Perhaps one would say "Ah, not just another Caesar Salad again!". 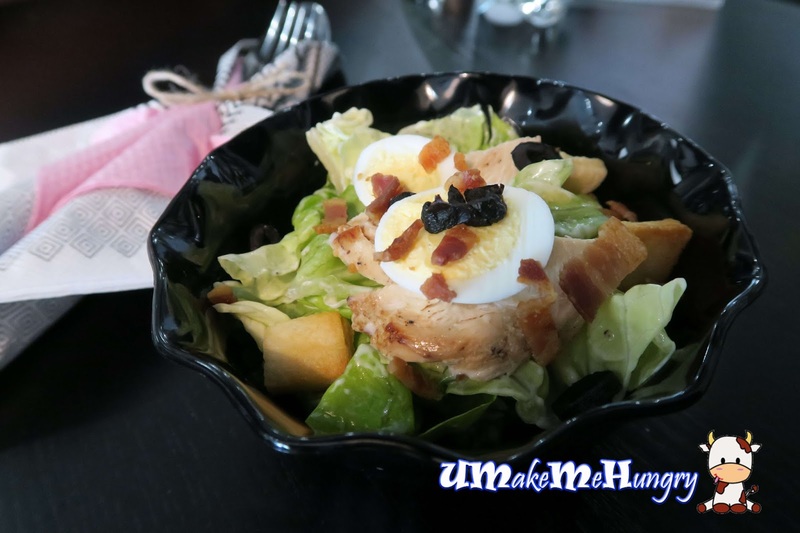 Indeed it is but a modified version with warm slices of healthy sliced chicken breasts apart from the usual ingredients like fresh greens, roasted olive, hard boiled egg, croutons and bacon bits. 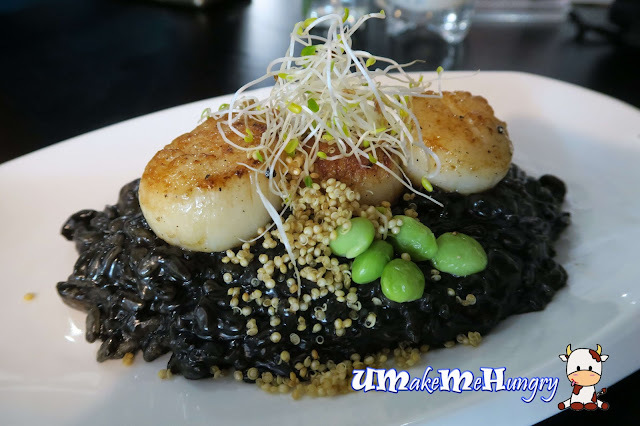 Starting our main course with this truffle infused Squid Ink Risotto and this was absolute stomach grabbing. The pan-seared scallops were nothing out of ordinary and was rather tasteless, not even giving a sweet bite. However the winning focus all went to the crunchy quinoa, parmesan cheese, edamame beans and alfalfa sprouts that had accompanied by every grain of creamy black ink coated risotto. Yums! 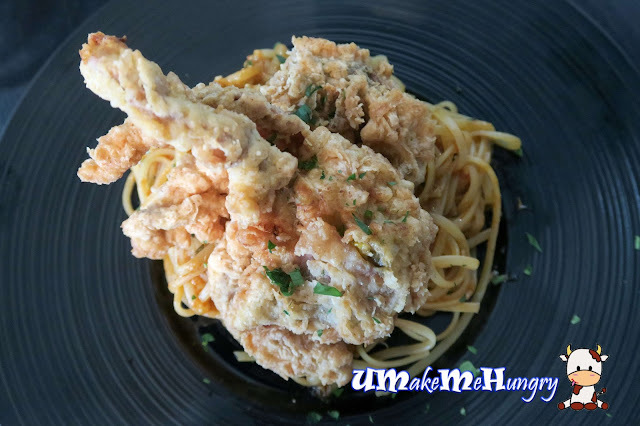 As they were dishing out the order, I thought they were serving some spaghetti with fried chicken stips from far and was kind of interested. 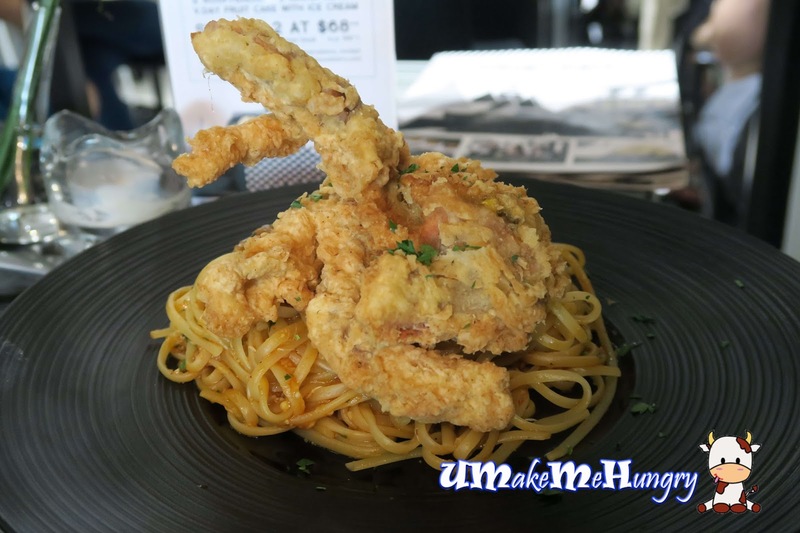 Who knows, they actually walked up to our table and placed the order in front of us, thus we realised it was the chilli Crab Linguini we had ordered. Spicy not? Well, i was quite adaptive to the level of spice and I would rate a level of 1 out of 3. Linguini had perfect texture and coated with Singapore's favourite - Chilli Crab Sauce with hints of stir-fried crab meat. Just alone with the pasta is good enough as a recommendation even without the deep fried soft shell crab that looked like fried chicken to me initially. Ending the 3 course meal with sweet note by this in house dessert created solely just for Valentine's Day. The platter is make up of a fruit cake and 2 scoops of ice cream. 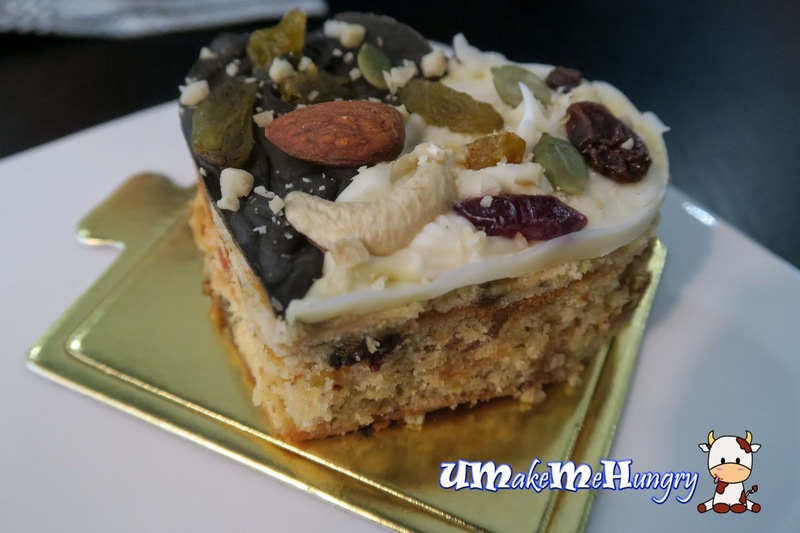 The fruit cake was decorated in according to the color theme of the bistro, black and white and was lovely done in heart shape showered with raisins, almonds and cashew nuts. Cake was quite dry and collapse into even smaller portions easily when we cut into bite size. 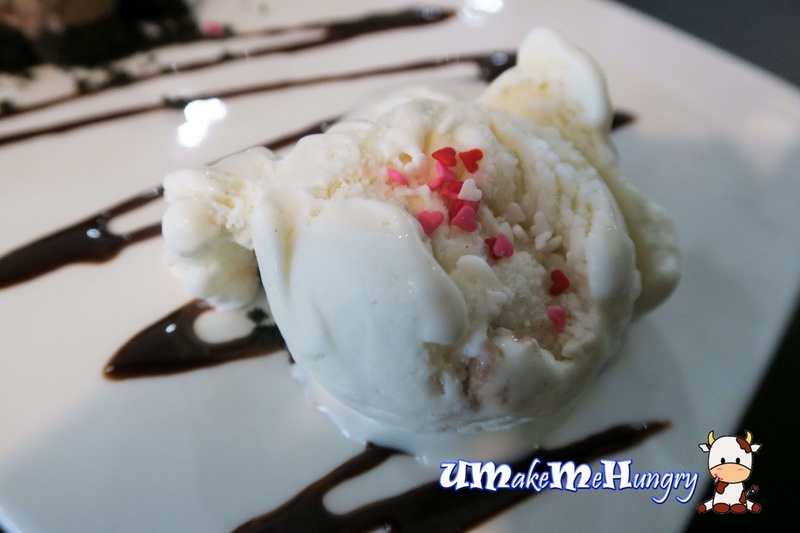 Not sure if the ice cream suppose to come in the shape of roses. 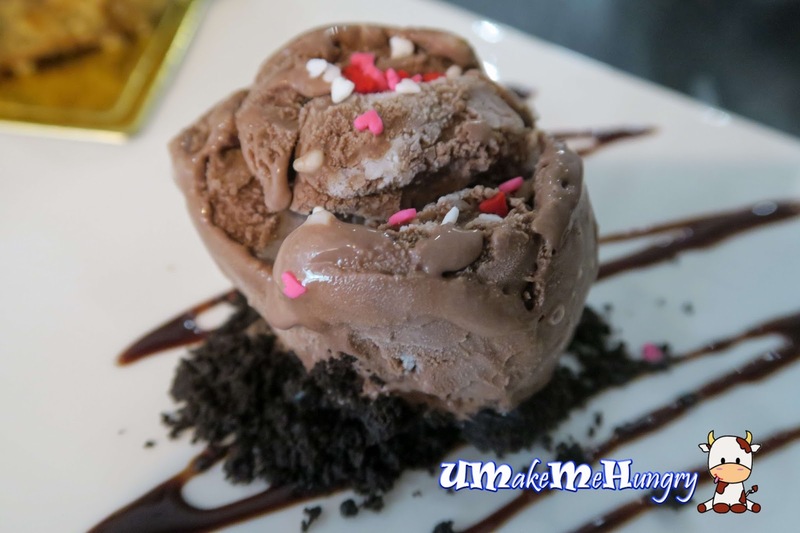 Chocolate ice creamed is showered with romantic heart shapes of icing and oreo crumbs were added to enhance the chocolate flavors. 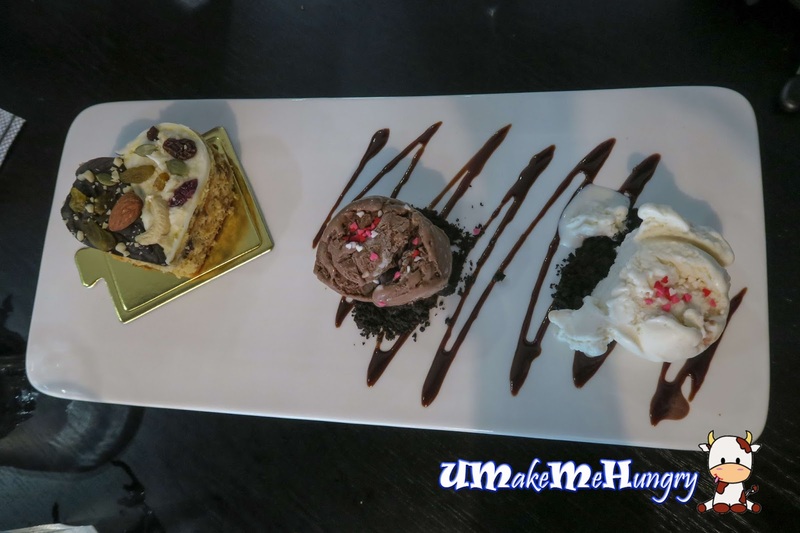 Zig Zag patterns using chocolate syrup had also elevated the presentation of desserts. 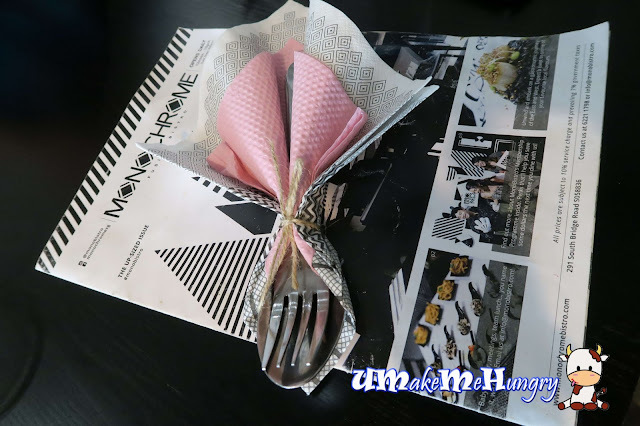 What I like about monochrome is the way that food was prepared even in a festive day. 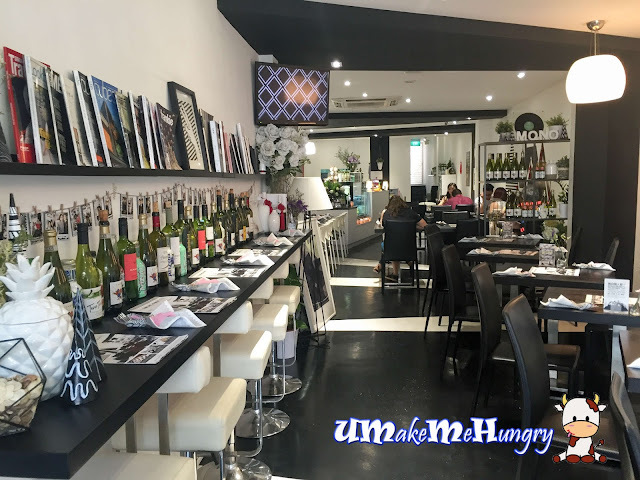 Instead of serving and cook in by mass order to save the amount of time used, they chose to served their customers base dish by dish ensuring that the standard of food maintains without compromising any factor. Unlike my past experiences during Valentine's day, waiting time was long with food came in a rush and dining period was limited. Monochrome was well organised with prompt service from servers and situation was more in control. The overall experience was great and left a good impression in me. A return visit is definite.